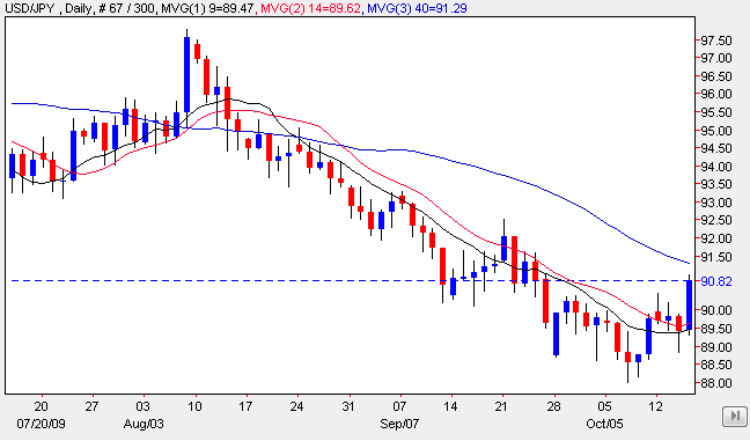 With the floor of the reversal from the downwards trend now firmly established in the 88.50 price region, the yen to dollar pair surged higher yesterday as the market bought US dollars in favour of the Japanese currency, and ended the day with a wide spread up candle which just failed to breach the 40 day moving average. Technically we now have two issues to consider in this current minor rally as follows – firstly, has the rally sufficient momentum to break through the resistance in place in the 90 to 91 price region, and secondly will the 40 day moving average provide any technical resistance to the move. Both these questions should be answered in today’s trading session for the yen to dollar pair, and should we see both these breached, then the reversal should continue to the next technical level at 92.50 which now waits above. The longer term trend, of course, still remains downwards, but with the Bank of Japan now waiting in the wings, it is generally agreed that any exchnage rate below 85 would be considered the trigger for an intervention, and indeed we may have already seem this in operation at the 88 price level last week. With no items of fundamental news on the economic calendar for Japan apart from a speech from BOJ Gov Masaaki Shirakawa in the early hours of this morning where he signalled the bank’s willingness to keep rates at the current 0.1% low market focus will be in the US this afternoon where the most important item will be the TIC figures. Details of these, along with other items of fundamental news are covered in my main euro vs dollar site. Meanwhile you can always keep up to date with all the latest fundamental news on the economic calendar, latest currency news and live currency charts by simply following the links. I have also included details on an excellent ECN broker.